Bistrot Paul Bert is a family owned restaurant in Paris that serves up a great piece of beef. Dorie Greenspan likes their pepper steak so much that she asked for the recipe and put it in her critically acclaimed cookbook Around My French Table. 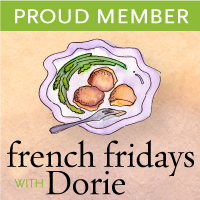 The online cooking group, French Fridays with Dorie liked it so much that they voted to make it together for this French Friday. I liked the recipe so much that I made it to share along with the rest of the Doristas who post their links here. There are more than 300 hundred excellent recipes in Around My French Table, including this pepper steak recipe. I’m not supposed to give the recipe so you should really consider picking up a copy of the cookbook, if you haven’t already. At Bistrot Paul Bert the steak comes with fries or frites but I decided on a lighter alternative and made a pan of oven roasted Yukon Gold potatoes to serve on the side. The potatoes are covered in a light coat of olive oil and sea salt. I bake them in a hot oven until they are golden brown on the bottom and flip them until they are colored on both sides. The steak was fun to make using pounded mixed peppercorns that are pressed into the meat. After cooking the steaks in a hot cast iron skillet with butter and grapeseed oil. I removed the them from the pan and poured in the Cognac, which gives off a lot of smoke. You may choose to either simmer or ignite the Cognac by tipping the pan towards the flame on the burner. There will be a lot of smoke coming off the skillet from the hot butter, oil and meat, which makes it a good candidate for outdoor cooking. We have a burner on our outdoor gas barbecue so I asked Scott to fire it up while I was bringing everything outside to cook. While the steaks rest after cooking the sauce is finished with a swirl of gently bubbling heavy cream and a slight amount of sea salt. Don’t be shy with those peppercorns, along with the sauce, they really make this dish. before even scrolling down I knew the steak was cooked perfectly to my liking and lo and behold it was beyond my expectations – I could have this right now. Mmm, beautiful pictures! Your steak looks perfect. That is one perfectly cooked steak Patty, I would have to shield my husbands eyes if he walked by here at the moment. I'm so glad I have that book. Might I add the photos are amazing. That's how I wish my steak was cooked, but I left it under the tent for too long, so it continued to cook itself. Oh well! I'll have to move faster next time. That looks beautiful, though! Those steak fries look wonderful – and the steak is just perfect looking! (The beautiful rosy pink that a good steak should be left at). Gorgeous photos! I love your silverware too. Beautiful post, Patty! It looks like a magazine shoot! We're making ours tonight – it looks positively delicious! Beautiful Photos and your steak looks absolutely delicious!! Your oven roasted potatoes look fantastic, Patty. I think I would have liked the meal better with a Syrah or Malbec. The Cabernet I had was probably too light for the peppery steak. Patty, you're right..the pepper and sauce really do make the dish. I slathered my steaks in both! And I must be the only one to notice this, but I absolutely adore that dachshund-like thing you rest your knife on! All I have to say about your dish is DELICIOUS! Your steak and fries look perfect…in fact, I want to eat your potatoes right now! Oh man, yours turned out spectacular. This was a big hit in our house as well. 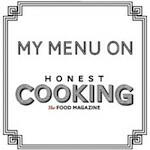 I cheated and made mashed potatoes this time but your photo makes me want to try the frites ! OH, that steak looks delicious! I could eat it right now. I found you at my friend cakeduchess and I'm following you from Trapani, Sicily. Patty – Thank you for visiting my blog and introducing me to yours! I don't know how I missed stopping by, but you have a beautiful blog with stunning photography. I skimmed through all of your FFwD posts, and others (those cupcakes with the candied violets OMG) and you've done Dorie proud! Looking forward to visiting more often. Patty-Your steak and fries are absolutely done to perfection. The pepper sauce looks yummy! Thanks for you kind comment re: my ankle, it's getting much better now, but I still can't walk on the left foot properly…it will take time. Always felt that steak frites was the ideal meal and one I would have to celebrate something, anything! Yours look fantastic and cooked just the way I would want to eat it! The oven-roasted fries were a good choice, they look beautiful, as does the steak. I wish I'd had an outdoor burner for this recipe – we have a very sensitive fire alarm! Your photos are always beautiful. That steak looks just perfect, what an excellent meal! My hubby would really go crazy for this meal! Your steak is perfectly cooked and he'd love the flavorful peppercorn sauce! Wow wow wow, Patty! As you may have seen on FB, hubby and I enjoy a good steak once in a while. As summer time is finally coming, I see more steaks in our future. We rarely put sauce on our steaks, but we do like to use some kind of marinade. Your sauce really brings this steak to the next level. Looking at it just makes my mouth water, and not to mention, your steak iand potatoes are done perfectly. A simple, yet beautiful presentation. Steak and wine are such a match made in heaven. I'm a big late in getting to review all the Doristas and when I got here I started to crave this classic dish all over again. Cooked just perfectly! You did a fantastic job with this Patty…looks perfect!